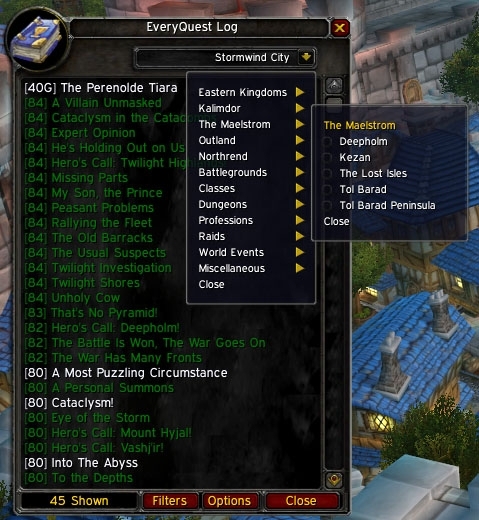 EveryQuest is a Quest History tracker and quest list window. Integrates with Lightheaded to show any comments for any quest in the game. 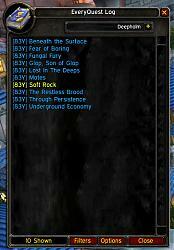 Create chat links by shift-clicking the quest name. Go to Current Zone Button (r184) - Click the Book! As you complete quests in game, EveryQuest will keep track of which ones you have done. It also tracks which quests you've failed or abandoned so that you can easily get them again. Once you complete a quest, the date and time is saved to see when you did it. Additionally if the quest is a daily quest, it keeps a running total of how many times you've done the quest along with the most recent completion date. 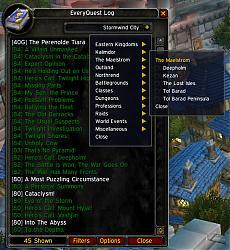 The quest list uses your quest history to display quests from any category in game. It lists quests you haven't done in zones (ex: Borean Tundra) so you can get the achievement easier. 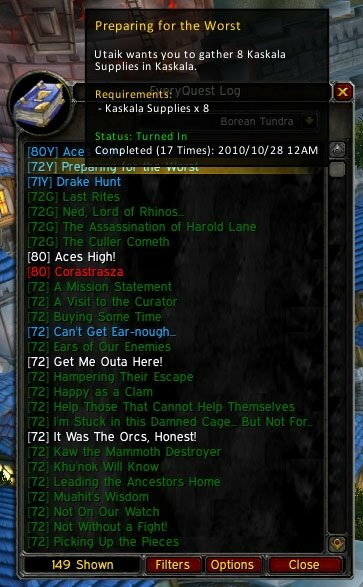 EveryQuest integrates with LightHeaded (Wowhead quest comments, NPC locations) so clicking a quest will open the wowhead comments for that quest. Lightheaded then integrates with TomTom waypoints to direct you to the quest giver. Refrain from posting bug reports to the comments section. Go to http://wow.kandarz.com/everyquest/upload.html and upload your global saved variable. Wowace localization is now setup for all you world travelers! Visit the localization page to translate. You're now able to get your quest history from the server! If you are using EveryQuest 2.3+ you're set. I finished up a quest giver module that mimics the functionality of Handynotes: Quest Givers but integrates EveryQuest quest history and filtering by faction (daily quest coloring/filtering maybe later). The zip file contains everything you will need to use EveryQuest. Although I recommend some additional addons to create a more complete package. If you are using the default questlog window, there will be a small button near the book icon with the letters "EQ" to toggle the window. Bind the window the a key using the key bindings interface from the main menu. 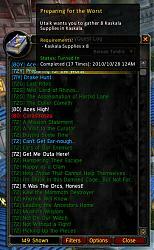 I wrote the addons Wholly and Grail to replace this one. They can be downloaded from curse.com if anyone is interested. Of course this has to be updated and an old build isn't going to work. Blizz revamped the entire structure of questing, not to mention revamping the majority of quests in vanilla areas, to the point that the addon was rendered useless, through no fault of the author's. I would assume this addon would likewise have to be rebuilt almost from the ground up, and that can be a daunting prospect after all the work going into it before cata. 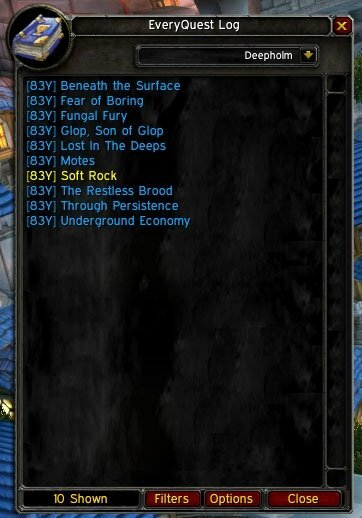 To the author, I too hope you rebuild this addon, it was damned handy in going after loremaster, but I can understand if you don't. Last edited by Jakk Frost : 11-12-11 at 12:48 PM. 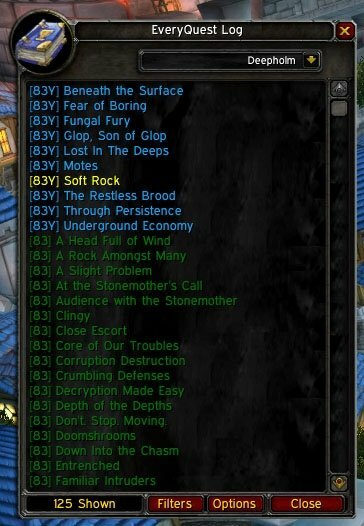 Any chance this addon will be updated? I'm getting sick and tired of constantly getting errors after picking up Cata quests or doing Hallow's End dailies. Double-ditto. 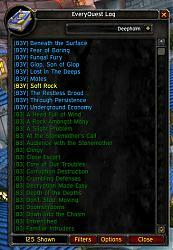 Great addon, but since Cataclysm it is absolutely unuseable. The constant errors occur literally every couple of seconds, sometimes wile in combat in a BG. While in TB, the errors came so fast and often I had to find a quit spot, unload the addon with Ampere, and reload, just so I could continue with the battleground. Is this addon dead? I REALLY REALLY liked this addon.... If it is dead... is there anything out there like it? I have parsed wowhead and I am working on the new global ignore list for quests removed from game. If there is no update by the time I'm done, I will upload r169 with the new quests (Dungeons, classes, etc.).. I would so love a reputation feature. A single quest says "Increases rep with XYZ by ABC" and in the search there's a filter "Increases rep with XYZ". Thanks for the addon anyway. The Author of Lightheaded has had numerous posts complaining about speed decreases whenever his addon is displayed. 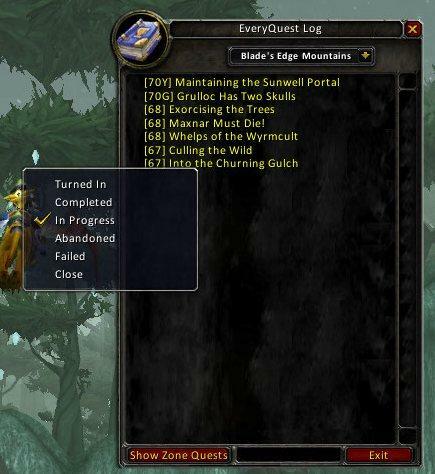 There's also a problem whereby selecting quests in the EQ list does not show the appropriate quest in LHeaded, but instead remains stuck on the last one selected in the quest log. He claims to have narrowed it down to the way Everyquest deals with the Lightheaded frame. I myself have been having this same problem. Is there any chance you could take a look at it? This Message: "EveryQuestTitle2:OnLoad" goes up to "EveryQuestTitle27 :OnLoad"
I hope i have you informed, and i hope you can solve this problem. The "EQ" Button on the Questlog window works and the system to check Done Quests works too. I attempted to access the upload page to send my .lua file and couldn't find the page. EveryQuest: Populate History: 3 quests not found in the database. Not sure if I can attach it here? Last edited by ringw0rm : 10-06-10 at 02:32 PM. love the combo with handynotes/everyquest questgivers, tho i have completed alot of quests before i put handynotes/everyquest questgivers in. 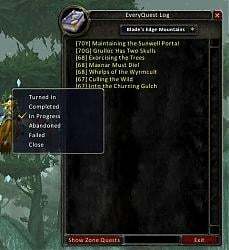 is it possible to have everyquest questgivers to read from everyquest database of completed quests and remove questgivers that i dont have any quest left to do for? would be awsome. The filters will do that, under the questgiver menu in the EQ options. Speaking of said filters, I love that you added Loremaster support via the [L], any chance you could add Lore master to the filters as well? Or is that asking for too much of a change?